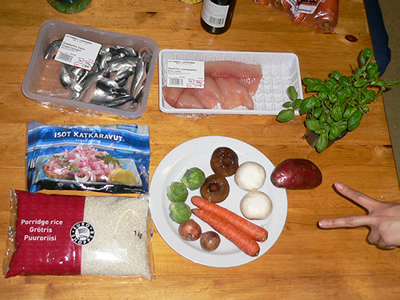 Main ingredients... this is just an example. You don't need much amount of ingredients. Since we fry them, they don't shrink. But variety is important to make your tempura colorful. These are recipe for 4 persons. Cut them into small pieces. We quartered mushrooms, cut potato with 5mm thickness. The point is every piece should fit to your mouth, since we don't use a knife when we eat it. 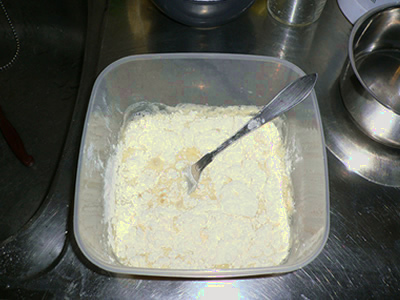 The batter is mixture of egg, water and powder. First mix one egg and about 250cc water. Afer mixing it, add some flour (for cake). You don't need to mix it very well, and take care not to make it warm. Pour much amount of oil into a pan (pot). 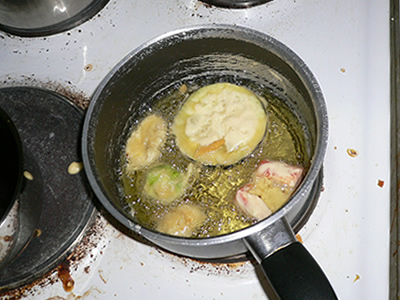 The oil should be enough to cover the top of the foods, so a shallow pan is not suitable. Keep the temperature around 180 degrees, and prepare a plate to put cooked ones. Drop ingredients into the coating, and put them into the oil. Take care not to put wet ingredents. 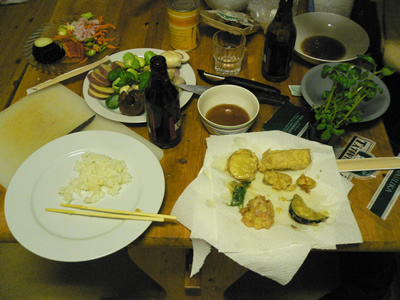 You can also make another type of tempura called kakiage. 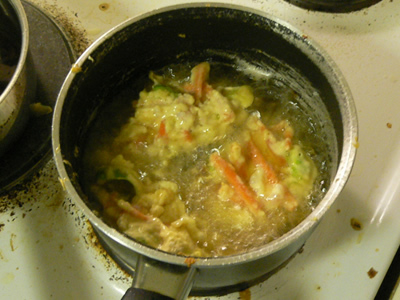 Small pieces of vegetables and shrimps are sticked together with the batter. Especially it is good with soba noodle (called Tempura soba). The way to cook it is similar, cut vegetables into small pieces, put things into the batter. Use a spoon to put it into the oil, and try to keep a good form while frying. Now it's ready. I took the picture long time after frying, but the color is nicer when they've been just fried. Remove some oil with the paper, and change the wet paper often. 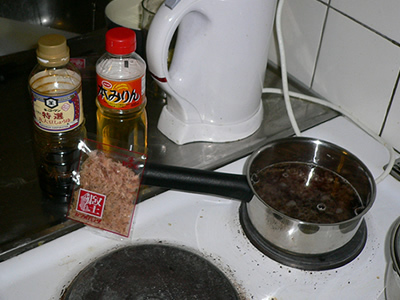 The dip is made from soy sauce (shoyu), fish flake (katsuobushi) and sweet cooking alchol (mirin). Put water and boil it. Then put the fish flake, soy sauce and mirin. They're ready now. Usually we eat it with steamed rice and miso soup (misoshiru). You can enjoy this style in a Japanese restaurant. But we can enjoy more relaxed manner. Everyone put what you want to the oil, and eat it just after picking up from the oil. You need to walk around all the time, but fresh-fried tempura is very delicious.